The damaging winds passed but the rain continued on into the morning. I took the dogs out for a stroll around the parking lot but they are a delicate and finicky bunch when it comes to rain. They have no problem diving into water if it’s on the ground but as soon as it’s falling from the sky, they seem to think that they are going to melt. So while they recovered from the indignity of going out in the rain with bowls of food, I planned out the day. Who am I kidding? I looked for coffee. And I found it with The Tamp & Tap in downtown Memphis. 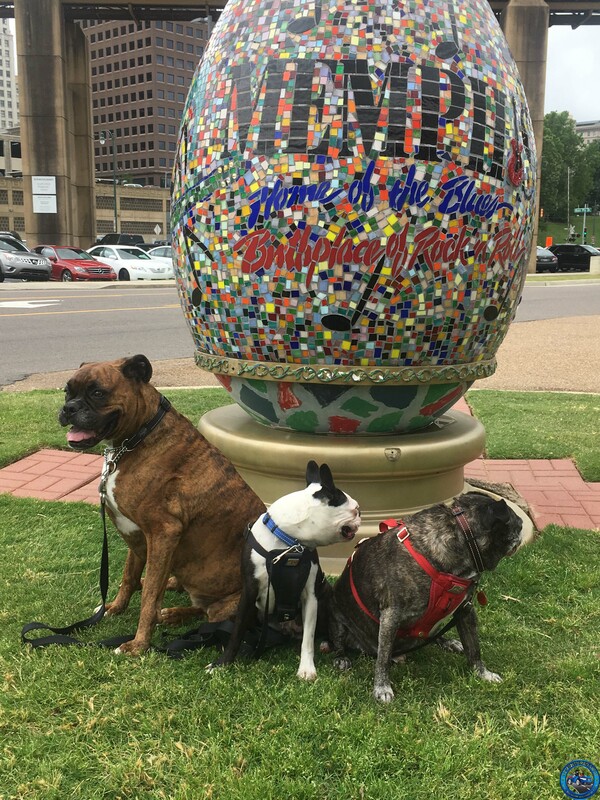 We crossed the bridge into Memphis during a break in the rain and when I saw the Welcome Centre, I took the opportunity to stop and let the dogs have a bit more of a leg stretch. Even though we had been next to the river, from our elevated vantage point, I was able to get a real sense of just how big this river was. I mean, what better gauge of size than to watch full-grown trees float past you? As we walked around the Welcome Centre, I stopped to speak with one of the staff and asked where we should go for barbecue. When there is “Memphis-style barbecue” you have to eat it. That’s just part of the rules. He told me a few places but two stood out: Interstate (which was on “Feasting on Asphalt”) and Central. Then I asked the all-important question: if you had to go to only one, which would it be. The hesitation before he answered said it all. He replied that Interstate was an institution but the food was better at Central. Well friends, I think we know which one I went to. After coffee of course. We came ready to rock. Trees in the Mississippi River for scale. The parking situation around the Tamp & Tap, well let’s just say it leaves much to be desired. I mean, there is plenty of places to park, if you don’t mind paying for it. I risked a parking ticket when I left my car in the lot across the street and dashed inside, practically dancing from foot to foot as I waited in line. When I mentioned that I wasn’t properly parked, she warned me that they are usually really strict with parking but they had already been by so I should be good for a few minutes. And despite the fact that I was in a rush, I couldn’t help myself and asked if they had any specialties of the house and as she was rhyming off a list of prepared coffee drinks, my ears perked up at raspberry chocolate. So I ordered one to go and practically bowled over everyone between me and the door, grateful to see that no one in uniform was anywhere near the lot. Downtown Memphis looked like the kind of place that I would have liked to wander around but the sky was a menacing grey so I punched in the address for Central BBQ and noticed that there were two and both were listed on bringfido.com as being dog-friendly. I picked the one at 2249 Central since it had slightly better reviews and started the drive. It was a short drive and soon we were in the parking lot. For a brief moment anyway because a gentleman who was directing the traffic in the lot had us park across the street. Navigating across four lanes of traffic was a bit of an inconvenience but I was hoping that it would be worth it. What usually happens at Central is that if you were sitting on the patio, you would order food at the counter and then go sit down and it would be brought to you. That wasn’t going to be so easy for me for a couple of reasons: there were a lot of people and I would have to find a place to tie the dogs where they would be close but still out of the way and about half of the patio had a heavy-duty tent around it so that meant walking through flaps and between narrow tables. I must have had an expression that begged for pity because one of the servers told me to sit down and she would bring me food. I practically hugged her right there and grabbed a table in the open area. It took me a bit to figure out how to open the umbrella and almost as soon as I did, the skies opened up. I sat in the chair, and into the puddle that was on it, to wait for my new best friend. I ordered the platter with three different meats and two sides, confident that I would be able to eat most of it. Well this time the food won. I ate my macaroni and baked beans but I barely made a dent in the turkey, pulled pork, and brisket. It was good but I found the meat was a bit dry and needed liberal dosing with the accompanying sauces. It was flavourful on it’s own but the flavour was kind of drowned by the sauce. The macaroni and cheese was outstanding and was my favourite part of the meal. I packed up what was left of my food and then spent way too long trying to get back to our car while standing out in the rain. This round went to the meat. 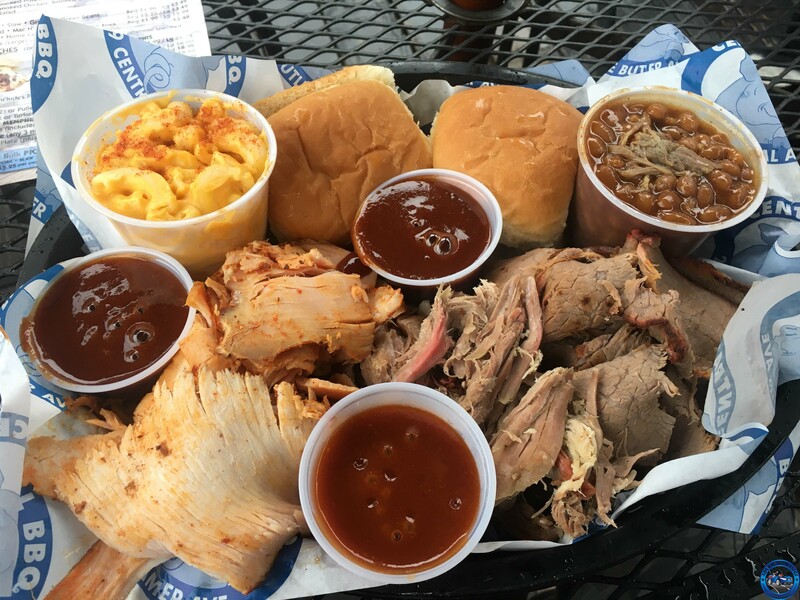 From top left: mac n’ cheese, buns, baked beans, brisket, pulled pork, and turkey. 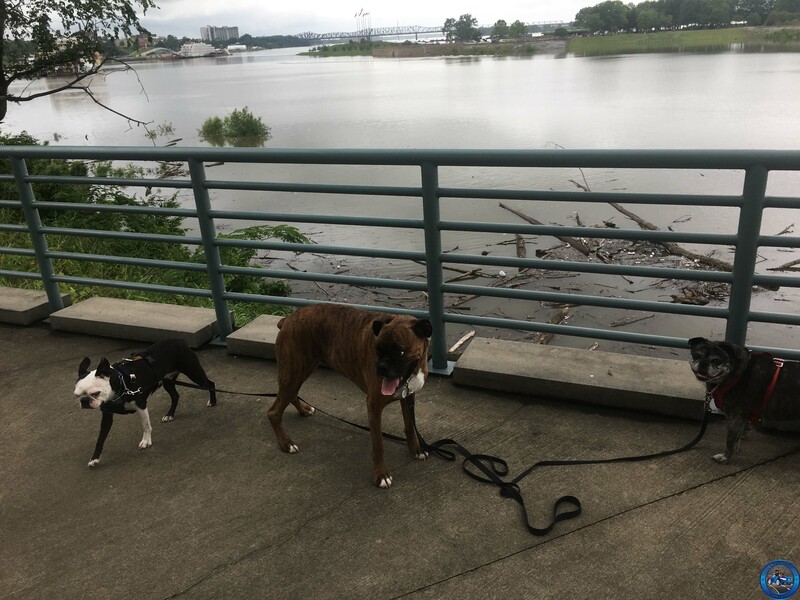 The dogs were so drenched, that when we did get eventually back to the car, I didn’t put their harnesses on until they had a chance to dry off since I was a little worried about them getting rubs from the straps. I followed the placards for the Great River Road out of the city and while we passed by some beautiful homes, we also passed by some neighbourhoods that stood in stark contrast, with more plywood than glass and restaurants sporting bars across windows and doors. It’s a shame that it rained as much as it did since it would have been nice to get out and explore. It also would have been nice not to be a walking buffet for legions of mosquitos. 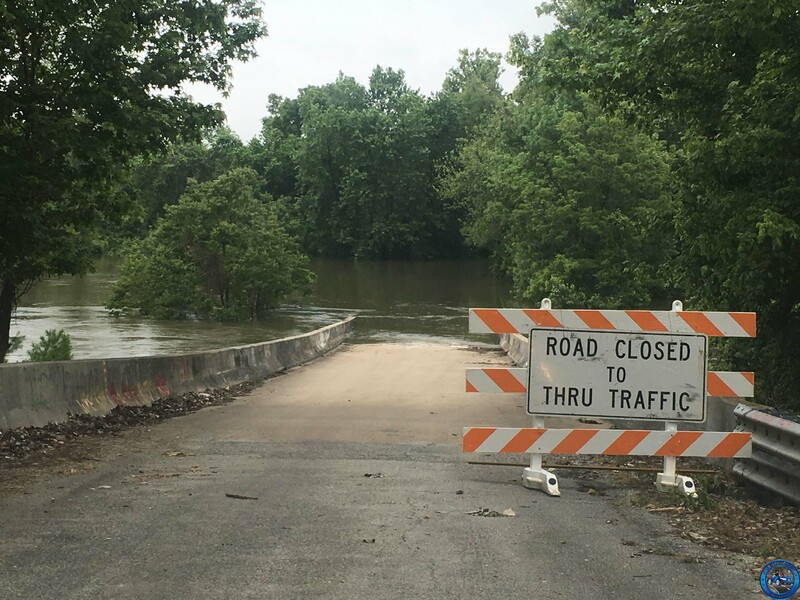 When we had to turn around to detour because of yet another flooded section of road and since there was a break in the rain, I took a chance to walk the dogs in what looked like a state park. Yes we braved the mosquitos and the possibility of another downpour to get in a bit of a hike. And it was quite a find when we stumbled upon Fort Pillow. Well we won’t be going that way then. I had parked the car on what kind of looked like a parking area but no signs to indicate as such. We followed a well-marked path but there wasn’t much in the way of signage to tell us what was ahead at least not like most parks that we have been to. When I did see signs for Fort Pillow, I expected to see maybe a sign and a drawing of what it would have looked like, not the fort re-created complete with a tent and guns. There were signs posted that explained that the fort was positioned over an area of strategic importance over the river, thus allowing control over boat traffic as well as the history of the fort. Considering how well it had been restored, I would have expected to see more people there or at least more signs for it. As it was, we had the whole place to ourselves and I spent longer than I expected, poking around and reading everything I could. If you’re a history buff, this is a great place to spend some time to reflect and really appreciate how these forts were constructed and what it would have been like to live there. In downtown Toronto, we have Historic Fort York which is huge but probably not reflective of how many other forts were constructed. When I was tired of being a blood donor, we headed back to the car and continued on. 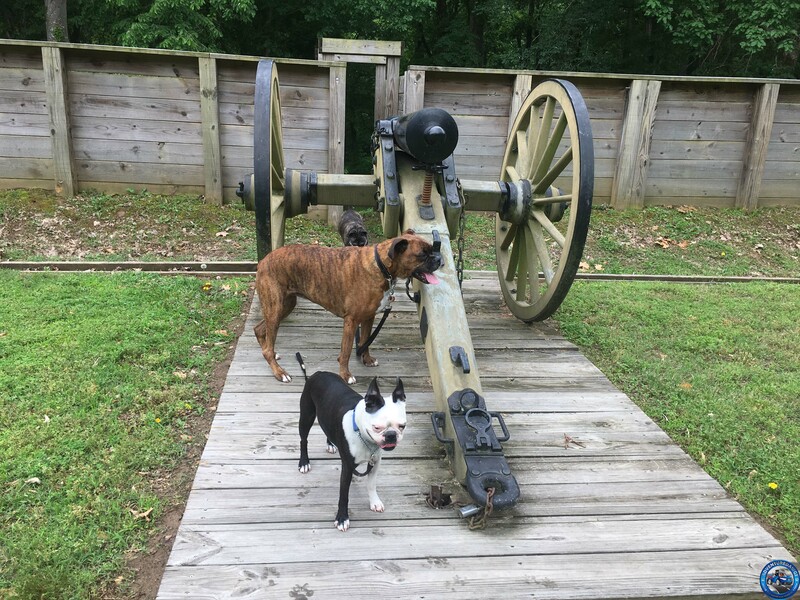 The dogs checking the firepower. 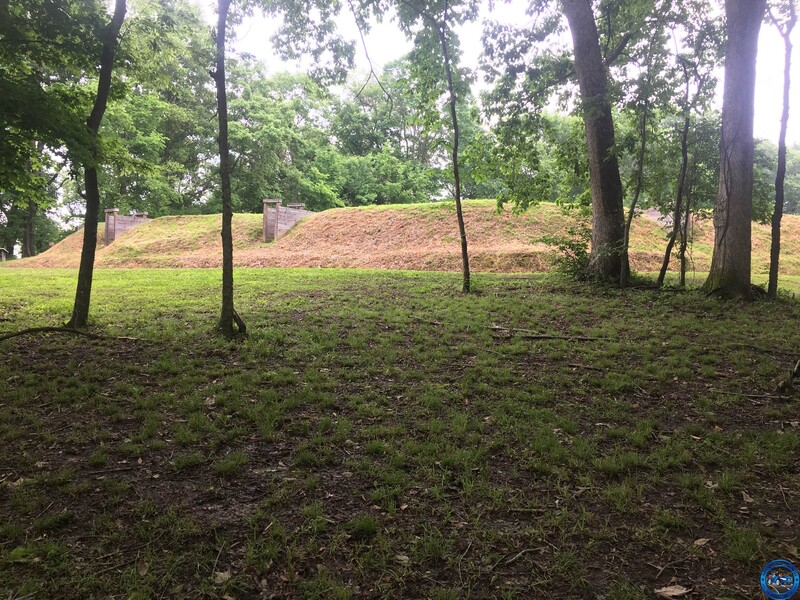 The land side of Fort Pillow. As it was getting late, I started looking for a place to sleep. We were in an area towards the north border of Tennessee and there was little in the way of hotels but I did start seeing a lot of signs for campgrounds. With options pretty limited and no call for rain over night, I set out to try and find them. And I did. Problem was a lot of those campgrounds were under water. Crud. Then I turned down one driveway, convinced that this would be the one. It was dark but it wouldn’t be the first time I’ve set up my tent by the light of my headlamp. I saw piles of leaves across the driveway but that’s to be expected after a flood. What I didn’t realize was that those leaves weren’t in piles but were covering tree limbs until BAM. To say that the language was colourful would be an understatement. 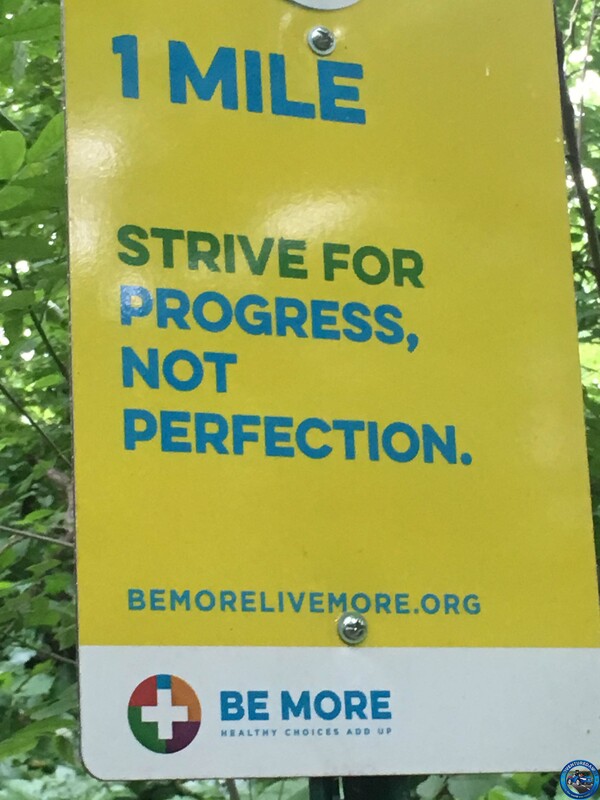 So there I was trying to back up and I just kept hitting more branches and limbs as I attempted a 98-point turn and continued back down the road, really hoping that every noise my car made was my imagination. Of course the noises go away when you turn up the music. I seem to be seeing this a lot. By this time, we were in Chester, Illinois which, as near as I can tell, has only one hotel. So I went there to see if they had any rooms available. And there were. With the room fee and the pet fees it would have only been just over $200.00. I tried to barter at least the pet fees down. I mean $25.00 per dog is a bit much but with no luck. So finally I just asked if there was somewhere I could park the car. 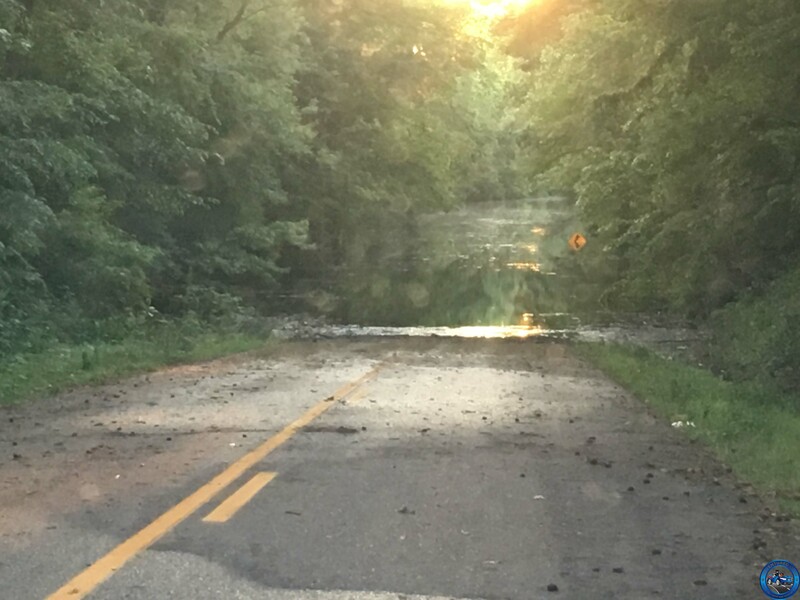 He told me that he wouldn’t mind if I parked the car in the lot but there was a campground nearby that shouldn’t be flooded because it’s on a hill. With the directions burned into my brain, we set out to find this campground. And we did find it and sure enough it wasn’t flooded. I drove around to get my bearings but the sites, or at least what I thought were sites were not well-marked so I wasn’t quite sure what I was looking at especially in the pitch dark. By this time I was too tired to really care. And too tired to eat anything. In fact, I hadn’t eaten anything since we left Memphis. I put some food and water out for the dogs before they all hopped back into the car and into their sleeping spots: Leo in the front seat with me, Jack in the front passenger seat, and Piper sprawled across the back seat. Needless to say, they were asleep long before I was. I guess Piper was a bit out of sorts since she usually snuggles with me so she kept her nose tucked into the crook of my neck. It’s sweet until she did the boxer snort and sprayed the side of face face with snot. As if that wasn’t bad enough, Leo kept shifting next to me so I ended up trying to contort around him. Heaven forbid the dog isn’t comfortable. I think Jack passed out the second he curled up. I’m so jealous of that. 4 response to "Of Meat and Mosquitos"
They’re good like that. I think they were also wondering where all their fans were. Imagine going into a city and NOT being met by fan club 😲 I don’t know why but parking tags are the worst! I could possibly get a smile if I was able to tell my stories in person. Then it becomes a performance.